Fashion Illustration Workshop in Notting Hill, for all ages. on cold February weekends – many of us prefer to stay inside under a warm blanket and watch Modern Family reruns. But if you’ve resolved for the new year, to branch out and explore new things you might visit the Debut Contemporary Gallery in Westbourne Grove which frequently offers workshops that are entertaining for both children and adults. 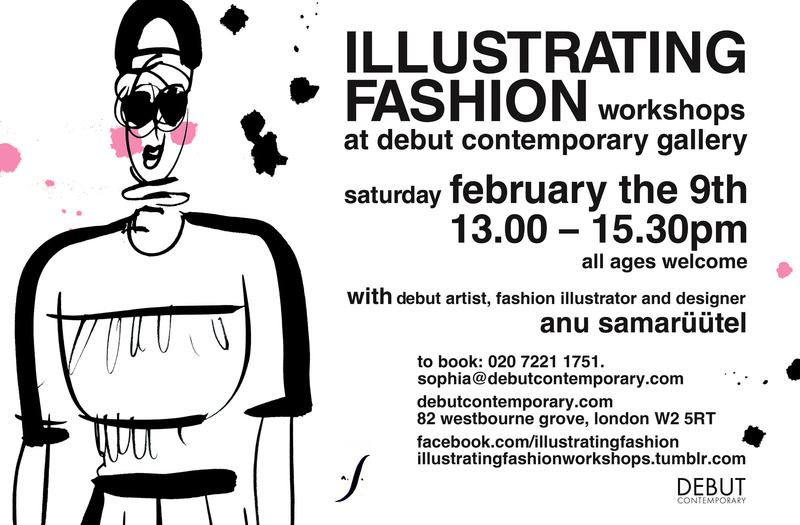 Why not try the Fashion Illustration workshop on Saturday February 9th? My daughter’s art class worked on an amazing project on site at the Gallery, so I’ve had firsthand experience with the excellent workshops that are offered. This entry was posted in Art, London and tagged Art, Children, Design, Fashion, Fashion Illustration, Illustration, Westbourne Grove, Workshop. Bookmark the permalink.